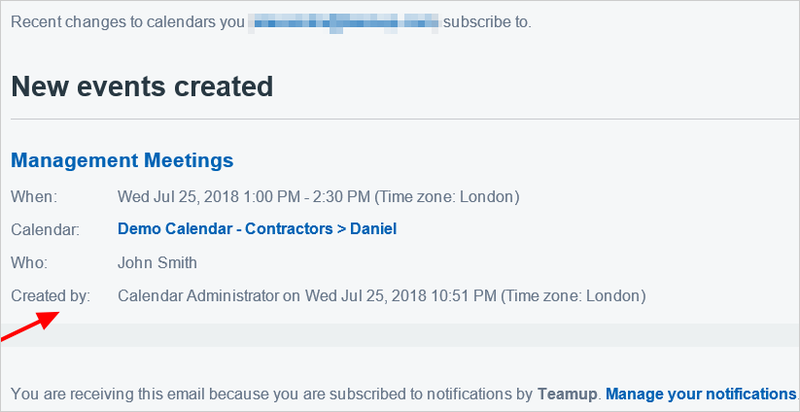 Teamup notifications allow users to be notified when changes are made to events on the calendar. The instructions below are for all users at any levels of access permission. If you have administrator access to the calendar, you can see all subscriptions to notifications in Settings > Notifications, and manage them accordingly. The default setting is to receive notifications for all sub-calendars as shown above. 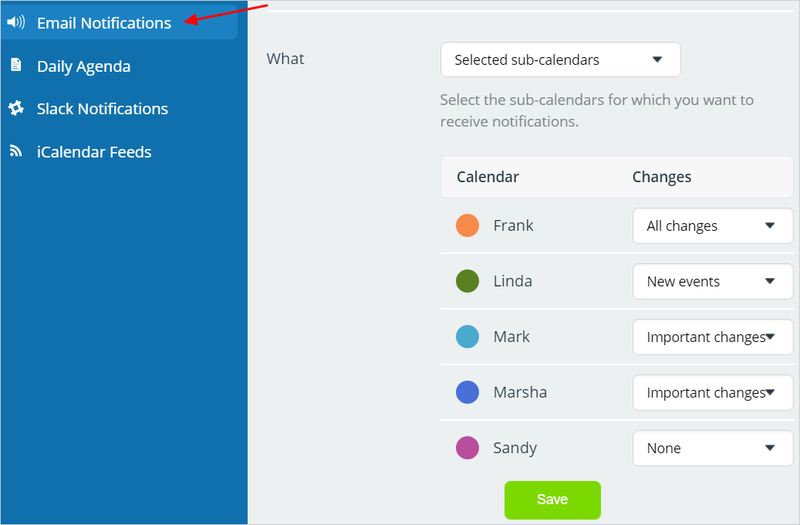 Choose Selected sub-calendars from the drop-down list to set up receiving notifications for selected sub-calendars only. Now choose what you would like to be notified about for each of the sub-calendars. Important changes include new events, deleted events, and date and time changes. The first line indicates the email address that was used to subscribe to the notifications. Events are grouped by the type of changes made. They link to the actual event that has been changed or newly added. The calendar to which the event belongs to is also listed and is clickable. For security reasons, DO NOT forward any of your notification emails to others who may not be authorized to access your calendar link. To share a calendar event with someone who does not have access to the calendar, use one of the Sharing options on the event itself. See more about sharing a calendar events. All your notification subscriptions for this email address are accessible by clicking the Manage your subscriptions link at the bottom of the email. Follow the Manage subscriptions link at the bottom of any notification email and you will see the notifications associated with that email address. Click Unsubscribe to cancel notifications, or Change to modify the notification settings. Email notification subscriptions are unique per calendar link and per email address. If you subscribe more than once using the same calendar link with the same email, you overwrite any previous subscriptions and only the last one is kept. To see what your email address is subscribed to, follow the Manage your notifications link at the bottom of the email. If you are new or not sure if you have subscribed, simply add your email address (again). It is important to sign up for notifications from the correct calendar link to ensure that the email that is sent has the correct link back to the calendar. So for example, if someone with Add-only permission should receive email notifications, then the calendar should first be viewed using their add-only calendar link, then Notifications opened and the person’s email address entered. Please note that if notification emails are added from the administrator link then all recipients will receive the administrator link to the calendar in their emails. This is a security and privacy risk. Use non-administrator links to set up notifications for calendar users. Ideally everyone should subscribe themselves, using the link that he or she was given to access the calendar. Do not forward any notification email because of all the links contained in the email are only for you, the subscriber. If you forward it to another person, that person would be able to gain access to all the calendar links where you have set up notifications, and unsubscribe all your notifications intentionally or unintentionally. Entering multiple email addresses for the same calendar link can lead to receiving many emails. So if you have more than one email address, be sure to add the most appropriate one, otherwise you will receive duplicate notifications to all of your email addresses. Changes to past events are only available to users of Premium calendars. Emails are sent a maximum of every 5 minutes and are delayed at least 5 minutes after the first change happens. These limits are in place to reduce email volume. Daily summaries are sent out between 7am and 8am CEST (Central European Summer Time) and CET (Central European Time). This translates to 5am to 7am GMT, 1am to 2am US Eastern Time, 10pm to 11pm Pacific Time and 4pm to 5pm Sydney time. Email notifications can be disabled or enabled by the calendar administrator in Settings. Disabling Notifications by the administrator in the calendar Settings does not unsubscribe any existing Notification subscribers, but only stops sending notification emails. If Notifications are enabled again by the administrator, subscribers will once again receive notifications emails. 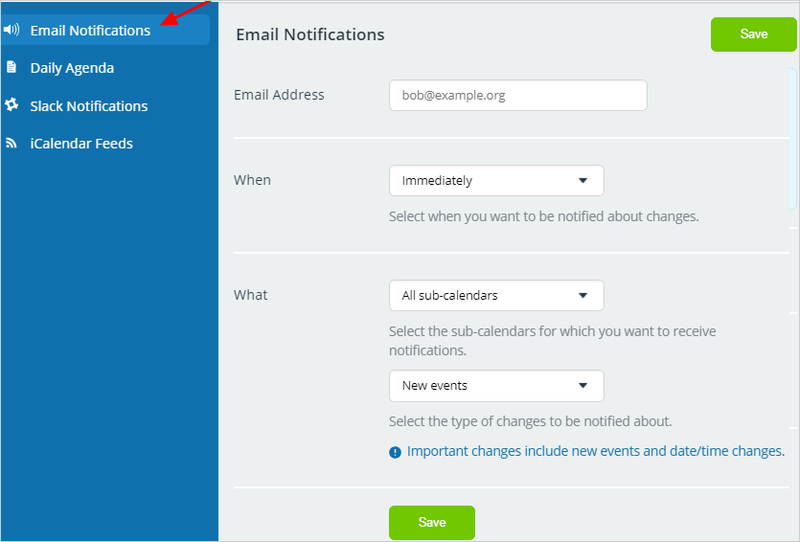 You can always subscribe an email address again for Notifications if you wish to change your Notification settings. When adding the same email address, any previous subscriptions are overwritten.